A record-breaking winter season is expected at Rovaniemi in Finnish Lapland continuing the success of the previous year. Massive investments are being made to respond to record demand: almost 1,200 more beds than last year will be available for the forthcoming winter season. Investments made by companies will reach over 30 MEUR. Accommodation options in Rovaniemi are an attraction in themselves. The more unique the accommodation, the more demand there is for it. From the new accommodation completed for the start of this winter season, you can choose between a glass igloo, a glass ‘kota’ apartment, a cone cow unit, a panorama view and ice cottages, and a wagon adapted for watching the Northern Lights. To be completed in the city centre at the end of January, the Golden Circle Suites will add another 25 boutique apartments. Alongside new investments, investments in expanding existing accommodation businesses have taken off. The Arctic Circle and the Santa Claus Village, in particular, are bustling with construction projects. Located next to Santapark, the Arctic Treehouse Hotel will receive six new ‘cone cow’ accommodation units for the Christmas season 2017, and another 20 units before the Christmas season in 2018. The biggest provider of accommodation services in the Arctic Circle, Santa Claus Holiday Village, has seen the completion of a new building with reception and restaurant facilities, and 46 new Superior cottages. The holiday village owners have also initiated a construction project for a hotel of their own, featuring 46 suites. Santa’s Hotels has built a total of 71 glass igloos within the Arctic Circle, as well as a new building hosting a restaurant and reception facilities. The opening ceremony will be held in early December. Renowned for its snow igloo hotel, the Snowman World at the Santa Claus Village is also expanding its accommodation offer with the opening of 14 glass apartments at the Snowman World Glass Resort on 1 December. The tourism facilities will expand into the areas surrounding Rovaniemi, including Apukka and Vaattunkiköngäs. The Apukka Resort specialises in northern lights experiences and ice buildings. In addition to hotel rooms, apartments and ice cottages, accommodation options include a heated wagon for watching the northern lights and, at a later date, northern lights huts with glass ceilings. In the surroundings of Kämppäkartano Vaattunki, a 15-minute drive from Rovaniemi Airport, the eco-friendly and mobile Panorama Design Huts, which feature glass walls, will be made available as accommodation in early December. As demand continues to grow, almost all new accommodation sites in Rovaniemi have the potential to make new investments. There are plans for several investments worth millions in the next two years. For example, the first Chinese investment in Lapland, the Nova Skyland Hotel, will be completed in several project phases. The first phase, building 14 wooden, semi-detached houses and a restaurant offering 144 seats, will be opened in November 2017. There are plans for completely new, unique types of accommodation capacity for the Arctic Treehouse Hotel based on investments worth five million euros scheduled for the near future. The winter season in Rovaniemi will continue from Christmas well into the spring, with an estimated rise of 15–20 per cent in the number of tourists. Most luxury accommodation units, which offer a little something extra, are almost fully booked for the busiest months of the winter season. The next goal is to productise the summer season in order to lengthen the tourist season across the entire year. Read the press release and download photos here. • Six new cone cows will be opened for use on 1 December 2017. • Accommodation capacity: 144 beds plus extra beds. Total: 38 cone cow units and 5 Arctic Glass Houses. • Specialities: Santapark has invested in the international Magic of the Arctic Circle Show Night show, with performances in December. The show features magic and acrobatics. • Upcoming: For the winter season 2018, additional 20 cone cow units. Investments in new accommodation capacity worth five million euros are planned for 2019–2020. Location: North of the Arctic Circle, about a 15-minute drive from Rovaniemi city centre. • To be opened on 1 December 2017. • Accommodation capacity: 77 beds plus extra beds. • Specialities: “The Northern Lights Headquarters of Rovaniemi”, out of reach of city lights. A unique ice sauna and a mobile sauna. The Aurora Wagon for watching the Northern Lights, equipped with a panorama window and offering the chance for overnight stays and watching the Northern Lights. Activities and building from ice. • Upcoming: Northern Lights Huts will be built during 2018, offering a total of 117 beds. • To be opened at the end of January 2018. • Accommodation capacity: 110 beds plus (a total of 25 boutique apartments). • Specialities: Each apartment features an ensuite sauna and bathroom with towels and robes. The apartments also have kitchens. A breakfast room and a bar are located downstairs. • Upcoming: Investments are planned in programme services, accommodation and restaurant services. • To be opened on 1 November 2017. • Accommodation capacity: 76 beds (7 semi-detached houses, a total of 14 holiday apartments). • Specialities: Each apartment features a private sauna, fireplace, kitchenette and a terrace. The room height is 6–8 metres in all apartments. • Upcoming: There are provisions for extension projects to be completed in several phases, next phase in 2018. Location: In the yard surrounding Vaattunki, a 15-minute drive from Rovaniemi airport. • To be opened in the beginning of December 2017. • Accommodation capacity: 30 beds (10 design cottages).The total capacity of the Kämppäkartano Vaattunki facilities is 77 beds. • Specialities: Eco-friendly cottages that can be relocated, if necessary, saving material and building expenses. The project design is based on nature experiences and the northern wildlife seen through the window walls. The cottages feature all the amenities of a hotel room. • Upcoming: 10 more Panorama Design Huts will be opened, meaning that the total number of beds will exceed one hundred in the 2018–19 season. • New Superior cottages will be opened in November 2017. The new Main Building at the Holiday Village and its new restaurant, the Three Elves Restaurant, were opened in August. • Accommodation capacity: In the new cottages, 184 beds (a total of 46 new cottages of Superior standard).The Holiday Village has a total of480 beds. • Specialities: Half of the new Superior cottages are spacious, loft-style cottages. • Upcoming: The hotel building project, featuring 46 suites, has been initiated, and the addition of a new restaurant at the Holiday Village is being planned. Location: At the Arctic Circle, north end of the Santa Claus Village. • The new glass-roof igloos and a building hosting a restaurant and reception will be completed in December 2017. 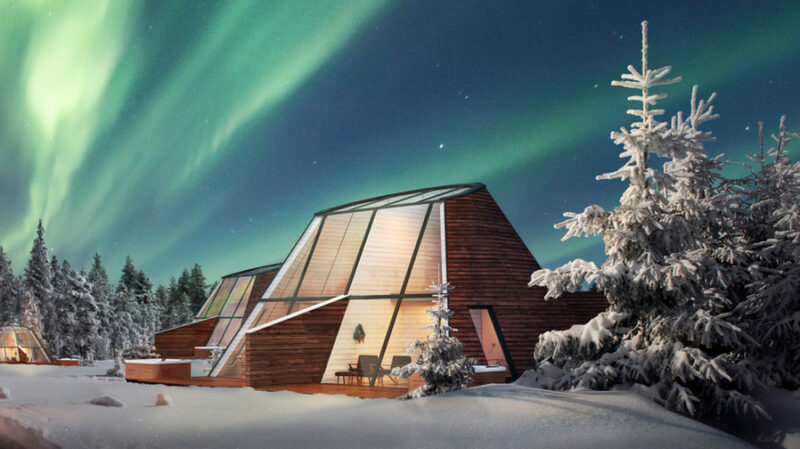 • Specialities: A glass ceiling for watching the Northern Lights, and, in the summer, the cooled igloo is perfect for admiring the midnight sun. The Arctic igloos were inspired by Lapland-style ‘kota’ huts. Each of the ten new igloos features an ensuite sauna. • Upcoming: As demand continues to grow, the company will be able to invest more in its properties. • Apartments at the Glass Resort will be opened on 1 December 2017. • Specialities: Each glass resort apartment has an ensuite sauna and an outdoor hot spa, heated to 38 C degrees, on the terrace. Special dinners at the Ice Restaurant in Snowman World, a snow igloo hotel and various activities on snow and ice, including ice slopes and ice-skating. • Upcoming: In the next two years, accommodation capacity will be extended, a new sauna world and restaurant will be completed in the Snowman World area, and the reception building will be expanded. The additional investments will total around 2.2 million euros. • The new extension of the Sporthotel was opened on 1 September 2017. • Accommodation capacity: 178 new beds in 43 Superior rooms. Santasport offers accommodation for up to 412 visitors in accommodation units of various standards. • Specialities: All rooms for 4–6 people feature a kitchenette and most rooms have a balcony. Complementary use of the spa and gym is included in all room rates. • Upcoming: Financed by a private funder and operated by Santasport, a new holiday apartment property, Ounasvaaran Helmi, will be completed nearby. This will mean the growth of overall capacity at Santasport by an additional 240 beds, to a total of 652 beds.